Now that fall is here, it’s prime time for dry skin. I have combination skin that tends to be on the oilier side, but even my skin takes a beating when the cold wind starts blowing. My three skincare must-haves to combat dry, flakey skin: exfoliator, oil and moisturizer. I’ve started using an exfoliator on mornings when I wake up to find patches of dryness on my face; I know my foundation won’t apply well if I don’t exfoliate. My current one of choice is Murad’s Pore Reform Skin Smoothing Polish. A little goes a long way, and it’s by far my favorite exfoliator I’ve ever used. For nighttime, I cleanse my face then apply The Body Shop’s Vitamin E Overnight Serum-In-Oil by patting it in all over my face. This stuff is truly amazing and moisturizing without being greasy. I’ll even use a tiny amount in the morning if I feel I need extra hydration. 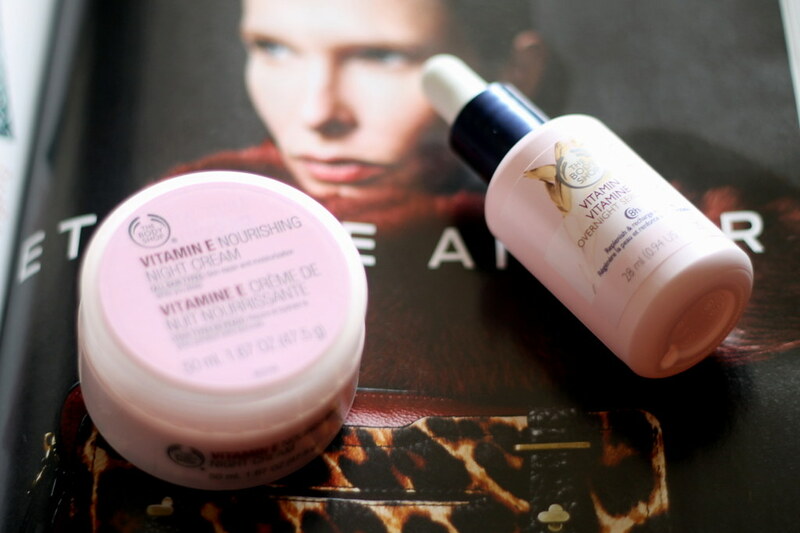 Then I like to apply The Body Shop's Vitamin E Nourishing Night Cream on top of the oil for an extra one-two moisturizing punch. I wake up in the morning with soft skin that’s almost always dry-patch-free. What are your cold-weather must-have skin products? Let me know in the comments below!